As I left the Albergue Jesus y Maria, Bernard, Pascal and Jérôme emerged. Jérôme was going to take a bus as he was not feeling well. Aline from Quebec in Canada was also there and would join Jérôme on the bus trip as her back was causing her some problems. Aline was 78 and had recently lost her husband, Fernand. She had decided to walk the Way of Saint James in his memory. Bernard, Pascal and I set off again under a cloudy sky. It was about 6.30 and no one was in the streets. We came across four tired locals, still a bit drunk and dressed like they were part of the wedding party I saw the day before. Two police officers were talking to them telling them that it was time for bed. We asked the police if there was a cafe open – they didn’t know. Everything was closed but on the outskirts of Pamplona we found a bakery and cafe that provided warmth and tasty ‘pain au chocolat’ and hot coffee. We were all a bit hesitant in leaving the warmth of the cafe. Soon the city was left behind as we passed through the lush campus of the University of Pamplona. The Way started to climb again. Suddenly I felt a sting inside my mouth. I realised that a fly or some other beast had flown in and stung me on the inside my mouth. The pain was short lived with an unpleasant aftertaste! Part of the way up the hill there was a cross and marker for another pilgrim who had perished on the way. Such memorials were always at the top of a steep climb. Another victim of a heart attack, the Belgian had only made it this far. 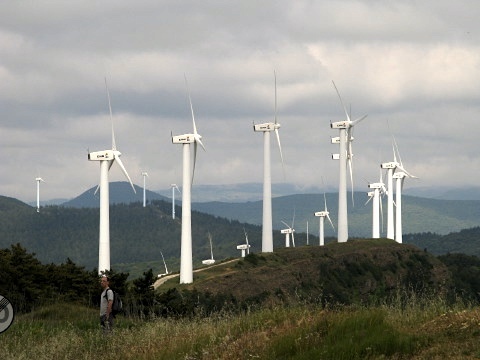 The ridge ahead was covered in wind turbines from one end to the other. Approaching you could hear the low swish-swish of their blades cutting through the air. Just before the top I came across Filippe from Annecy again. We had had dinner in Roncesvalles and his sense of humour was still intact after the climb. Fhilippe was a newspaper cartoonist and had illustrated many algergue guest books on the Way. He stood silently for a moment scanning the horizon before announcing ‘it looks just like Spain’. He was a calm thoughtful man with a wicked sense of humour. We climbed slowly together for a while until we made the summit of the ridge. Together with Pascal and Bernard we heated some soup in the lee of the hill. I questioned at having soup in Spain, a country that was supposed to be so hot at this time of year. The locals said the weather was totally bizarre and uncharacteristic for June. Filippe, dressed in white, and being attacked by swarms of green beetles, wanted to escape the torment. Some beetles ended up in the soup. There were many more pilgrims than in France. Everyone said ‘Buen Camino’ all the time and it was already becoming a bit of a routine. I reflected on the peaceful solitude of the days in France. 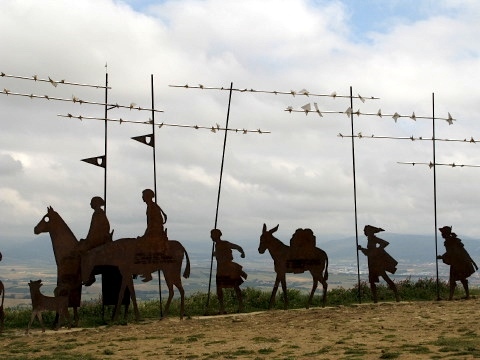 At the top of the ridge (Alto del Pedron) was a modern art sculpture – a long iron silhouette of pilgrims, their staffs and horses. It was quite beautiful and inspiring for the Way ahead. Many people milled around taking photographs. Some were pilgrims and walkers, others came by motorised means. Open land followed the descent and it became warmer. Wheat fields lay ahead and the breeze amongst dwarf pine trees was peaceful and calming. The scent of the trees was mixed with the heavy smell of damp wheat drying in the sun. It took a while to find some water in the next village. A sudden ‘hot spot’ on the right foot signified a new blister forming. I stopped and Parcal and Bernard provided me with a blister patch. All was well shortly after. Puente la Reina arrived soon. The village was wonderful. The Alberge de los Padres Reparadores was clean, simple and welcoming with a large garden and shady trees. The man in the albergue was fixing blisters using a needle and thread to drain the blisters. 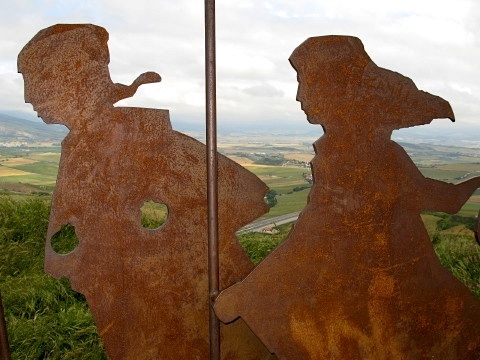 It appeared he did this often for the ‘new’ pilgrims that had started walking in Roncesvalles or Saint Jean Pied de Port. Day three or four was when the blisters usually started to appear. 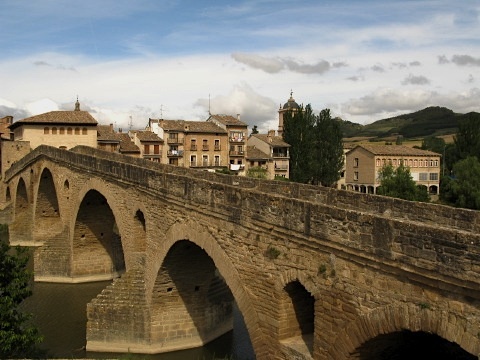 At the end of the village was the Puente de los Peregrinos, a 11th century bridge built to allow the pilgrims to cross the River Arga. It was a beautiful bridge and the setting sun later in the evening showed it at its finest. I met with Kaas again and later in the evening we had a Patxaran in a cafe. Kaas then ventured into an acoustic corner of the square and sang another of his Russian carols to the delight of the locals and other walkers sitting in the evening warmth. Patxaran is the perfect way to end the day. Sound sleep always follows. TIP: Wear darker coloured clothes during the day and lighter or white at night. It seems to keep the insects away. 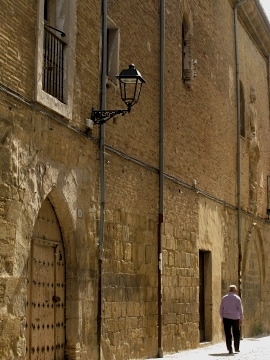 This entry was posted in From the Way and tagged Pamplona, Puente la Reina, Via Frances, Way of Saint James, Week Five. Bookmark the permalink. Post a comment or leave a trackback: Trackback URL.